This year, Portland Trails made big strides with community collaboration and placemaking, conservation, and active transportation projects, and made significant trail improvements and upgrades. Volunteers in the Pope Preserve in South Portland. Portland Trails supported three mini-grants this year focused on expanding placemaking efforts and empowering neighborhoods to activate local spaces. In collaboration with the South Portland Land Trust, Portland Trails managed twenty volunteers from the Mill Creek and Knightville neighborhoods to transform a parcel once covered in trash and invasive species into a green space enjoyed by the public. The team installed granite benches along the waterfront by the Mill Creek Hannaford and planted dozens of native plants. From this lovely spot, you can now sit and enjoy the view of Casco Bay and appreciate the new plantings, or walk or bike along the South Portland Greenbelt to Bug Light for more expansive views. In Portland’s Libbytown neighborhood, Portland Trails worked with the neighborhood association to install benches and create formal walking paths in the new community garden on Douglass Street. Outside of athletic fields, the neighborhood does not have any formal parks, so the new community garden has become a gathering place. The neighborhood wished to expand access to the general public and activate the space. This summer, Portland Trails helped sponsor an outdoor neighborhood movie night and built temporary seating, including some giant Portland Trails adirondack chairs! In the fall, staff and neighbors installed permanent benches, handicapped accessible garden beds, and planted blueberry bushes for all to enjoy. In collaboration with the West End Neighborhood Association, Portland Trails supported community designed and decorated electric traffic boxes throughout the neighborhood. Residents will spend the winter designing the boxes to highlight interesting neighborhood features and painting will take place in the spring. “These boxes will be painted with artistic renderings of walking maps to enliven the neighborhood streets and pique the curiosity of passers-by, in addition to being unique directional tools,” said Trails & Active Transportation Manager, Jaime Parker. 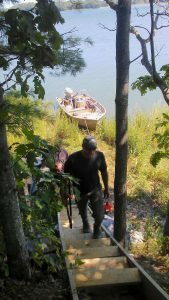 Trail staff walk up a newly installed staircase to do conservation work on Berle Mile Pond. and Berle Mile Pond, both of which are only accessible by water. Brickyard Point is a 14-acre peninsula with a loop trail bordered by I-295, the Presumpscot River, and Skitterygussett Creek. Berle Mile Pond is a 19-acre gem with a loop trail that can only be accessed by the Presumpscot estuary at high tide. The grant allowed Portland Trails to focus efforts on improving critical high-value habitat. Trails staff, Daniel, Jamie, and Connor removed invasive plants such as knotweed, multiflora rose, phragmites, and barberry bush. We also worked to mitigate erosion points to improve water quality and encourage native plant growth. Throughout the project, Portland Trails partnered with Maine Island Trails Association, the Presumpscot Regional Land Trust, and Casco Bay Estuary Partnership. Did you know that, with 239 acres, Evergreen Cemetery is the second largest cemetery in Maine? It was established in 1854 as a rural landscape with carriage paths, ponds, trails, footbridges, sculpture and gardens. There is also an extensive wooded area behind the cemetery with numerous trails that are well loved and frequented by the surrounding Deering Center neighbors and visitors. 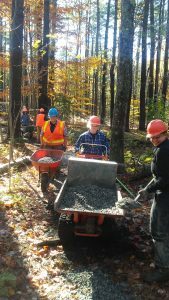 After the City of Portland conducted a forestry project earlier this year, they hired The Maine Conservation Corps and Portland Trails to rehabilitate displaced trails. Portland Trails managed a MCC crew that spent this autumn re-hardening surfaces and building and replacing both wooden and stone bridges. Maine Conservation Corps helps out in Evergreen Cemetery. During our corporate and public volunteer days, Daniel has had volunteers focus primarily on essential trail maintenance. 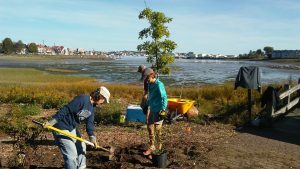 For example, volunteers upgraded a number of trails in the Fore River Sanctuary, where foot and bike traffic has significantly increased over the past few years. A large group of volunteers from the Beacon group were a huge help on the Presumpscot Trail in Westbrook, repairing thousands of dollars in ATV damage from this spring. Volunteers also made significant strides on the Stroudwater Trail and Presumpscot River Preserve. The difference on the ground is noticeable, so if you haven’t been to any of these properties in recent weeks, go take a look! Portland Trails added a few new Adopt-a-Trail partners this year, including Martin’s Point and Infinity Credit Union. We’re excited to have so many great local businesses on board supporting the trail network. A number of our Adopt-a-Trail partners sent employees out for a work day this year, and they’ve been a huge part of our effort to improve user experience on all our trails. This is just a snapshot of the work Portland Trails does throughout the year. Our staff, board, and volunteers are actively committed to transforming Greater Portland into a healthier community for people-powered transportation, conservation, and recreation. As 2017 winds to a close, we look forward to another year of improving the health of our environment and community for years to come. You can support this work with a gift to the 2017 Annual Fund. Jaime and volunteers install a new bench in the Presumpscot River Preserve.